In school we're taught that every citizen, starting at the age of 18 has the right to vote. But how true is that? We refer to voting as a right or even the duty of every citizen in this country. 1. The Electoral College was established to prevent pure democracy. As we've seen in two of the last five Presidential elections, the majority of voters preferred the Democratic candidate but the Electoral College awarded the Presidency to the Republican candidate. 2. To prevent the poor from being given an equal vote, property laws were instituted. Because why should you get to vote if you don't own land? 3. Non-white men were given the right to vote in 1870 (15th Amendment). Women were given the right to vote in 1920 (19th Amendment). Before that, only white men could vote. 4. Of course even having the right to vote doesn't mean people were allowed to vote in practice. To prevent poor women and minorities from voting, poll taxes were put in place and not repealed until 1964 (24th Amendment). But we're in the 21st Century now, right? This is a post-racial America, right? Not even close. Voter ID laws may sound reasonable, I mean who wants voter fraud? Skin more than two shades darker than alabaster? 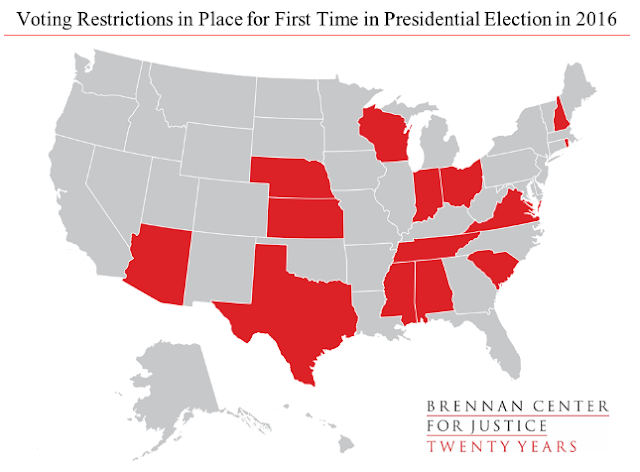 You probably would have had a problem voting in these states. Trump didn't win every single one of these states, but he outperformed the polls in all of them.